NYC, 02/25/2019, 1:00PM. 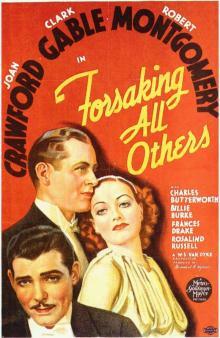 Forsaking All Others (1934): Romantic comedy-drama starring Joan Crawford and Clark Gable. 83 min. Director: W.S. Van Dyke. Starring Robert Montgomery, Joan Crawford, Clark Gable. According to MGM records, it earned $1,399,000 in the US and Canada, with foreign revenue of $800,000 and a cumulative total profit of $2.2 million, MGM earned a profit of $1,132,000. This film was Crawford's most financially successful film to date.